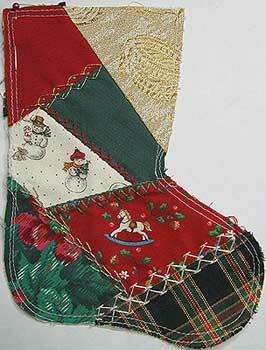 To get in the mood I have pulled out a 6 inch christmas stocking that I pieced and started to embroider 5 or 6 years ago and added beads to 2 of the seams. The second seam is Double Feather Stitch, I added a white seed bead and a petit red bead to the end of each stitch. I love how you got plaid in there. The stitching on both rows is very Christmasy, and nice from a distance, too. Hope you are sleeping okay now!